The guava is a very attractive plant that grows well in most of Southern California and produces large crops of tasty guava fruit. There are dozens of varieties of guava grown in California, most of which are in the group referred to as "tropical guavas". The tropical guavas include the white Brazilian guava (goiaba branca do Brasil) and the pink Brazilian guava (goiaba vermelha). There also are the two varieties of cattley guavas, popularly known as the "lemon guava" and the "strawberry guava", and there is the feijoa which is a very different Brazilian guava variety that is popularly known here in the USA as the "pineapple guava". There are some rare and unusual guava varieties that can be grown in southern California as well like the Costa Rican or Cas Guava (psidium friedrichsthalianum) which produces very acidic fruits up to about 1.5 inches long that are used mainly in juices and jellies. Guavas like full sun in Southern California, and once established there they usually are fairly drought tolerant. Most guava varieties can withstand several degrees below freezing with little effect. Most guavas grown in California are evergreen shrubs or small trees which commonly grow there to about 15 feet tall. As tropical guava trees grow, the papery bark peels off showing the trunk underneath. In California, most guavas are early flowering in spring with fruits typically ripening in September thru November, and some varieties like the "maroon guava" have a much later season with fruits ripening from December thru March. The maroon guava is aptly named as its fruit, leaves, flowers and its branches are all a reddish-purple color! Guava flowers are usually quite showy. 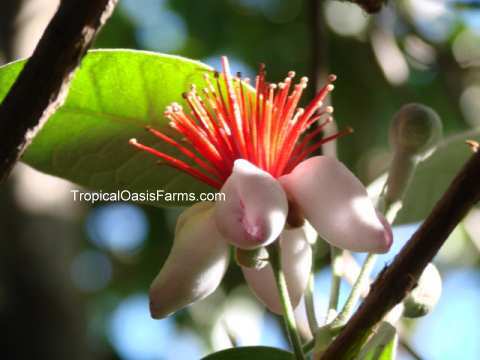 The flower petals of the pineapple guava are edible and have a sweet cinnamon-like flavor. Guava fruits range in size up to about 4 inches in the largest varieties. Depending on the variety, most guava fruit are highly prized when picked & eaten fresh off the tree. 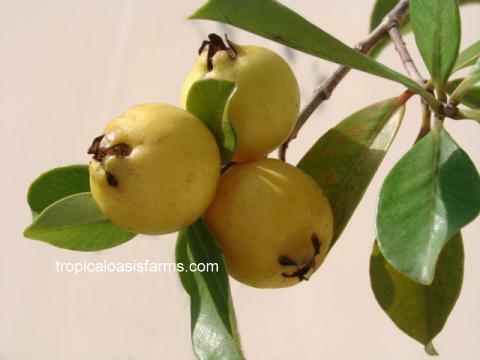 Most guavas are high in pectin and are great for making jellies and jams. Guavas also freeze quite well, so they can be picked at maturity and frozen for later use. Tropical guavas are usually propagated by seed, although grafted varieties are also available. Seedlings of tropical guavas usually take only 3 to 4 years to begin producing fruit. The pineapple guava originated in the somewhat cooler climate of southern Brazil where it is known as feijoa. The pineapple guava has a unique flavor that is very different than other guavas. 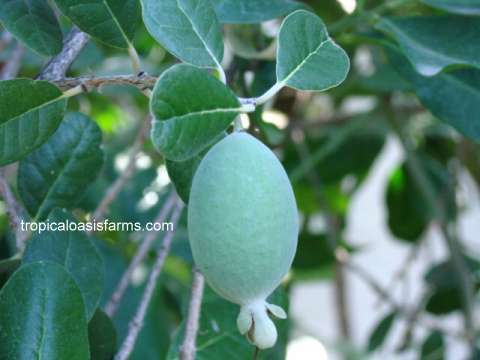 Another feature of the pineapple guava that is unlike most other guavas is that the interior of the pineapple guava fruit is usually scooped out with a spoon and the skin is discarded. The fruits also last longer than most other guavas after being picked and remain in good condition for a few weeks if kept cool. The seeds of the pineapple guava also are very small compared to other guavas. The pineapple guava seeds are so small that they are not noticeable when the fruiy is eaten, which is certainly not the case for most guavas! In California the pineapple guava is an evergreen shrub or small tree which commonly grows there to about 18 feet tall. 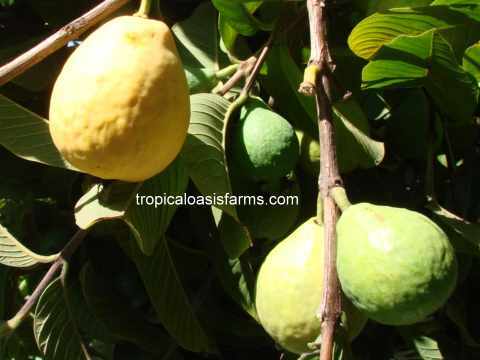 Once established, the pineapple guava is fairly drought tolerant although regular watering is important during fruit developement for larger size fruit which can reach over 3 inches long. The pineapple guava can also withstand temperatures of about 15 degrees below freezing with little effect. Another interesting feature is the flower petals of the pineapple guava which are edible and have a sweet cinnamon-like flavor! The Brazilian pink guava (also known as goiaba vermelha) is a sub-tropical guava with yellow skin and aromatic pink flesh. In California the Brazilian pink guava is an evergreen shrub or small tree which commonly grows there to about 15 feet tall. Once established, the Brazilian pink guava is somewhat drought tolerant although regular watering is important for good fruit developement. The Brazilan pink guava can withstand temperatures of several degrees below freezing with little effect. The Brazilian pink guava fruit generally are 2-3 inches in size. It has a mild sweet fruity flavor that is very agreeable. The fruits are perishable and they can bruise easily after being picked. The Brazilan pink guava is very popular as a backyard fruit tree for eating fresh picked guavas right off the tree and for making fresh guava juice! The fruits ripen in California September thru November. The Brazilian white guava (goiaba branca) is a sub-tropical guava with yellow skin and aromatic white flesh. In California the Brazilian white guava is an evergreen shrub or small tree which commonly grows there to about 15 feet tall. Once established, the Brazilian white guava is somewhat drought tolerant although regular watering is important for good fruit developement. The Brazilan white guava can withstand temperatures of several degrees below freezing with little effect. The Brazilian white guava fruit has a mild sweet flavor and they generally are 2-3 inches in size. The fruits ripen in California September thru November. The fruits are perishable and they can bruise easily after being picked. The Brazilan white guava is one of our most popular guava varieties for eating out of hand straight off the tree! The lemon guava is a cattley guava variety that originated in eastern Brazil. It has a distinctive lemon-like flavor that is sweet and tasty. The yellow skinned fruits of the lemon guava are generally about one inch or slightly larger in size. 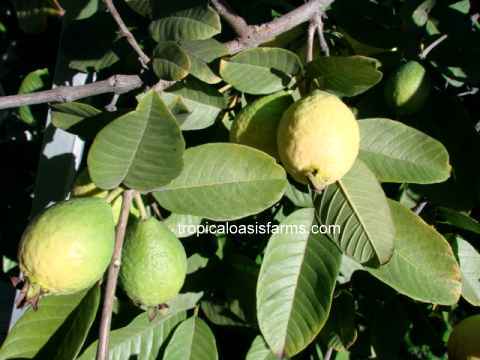 In California the lemon guava is an evergreen shrub or small tree which commonly grows there to about 15 feet tall. It is a fairly slow-growing plant smooth glossy leaves. It is an attractive ornamental and is often used in hedges. 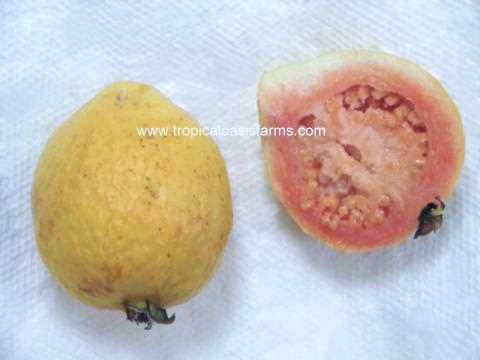 The lemon guava is fairly drought tolerant although regular watering is important during fruit developement. The lemon guava can also withstand several degrees below freezing with little effect. The strawberry guava is also a cattley guava from eastern Brazil with a strong strawberry-like flavor that is sub-acid. The fruits are generally about one inch or slightly larger in size whith a reddish skin and white flesh. In California the strawberry guava is an evergreen shrub or small tree which commonly grows there to about 18 feet tall. 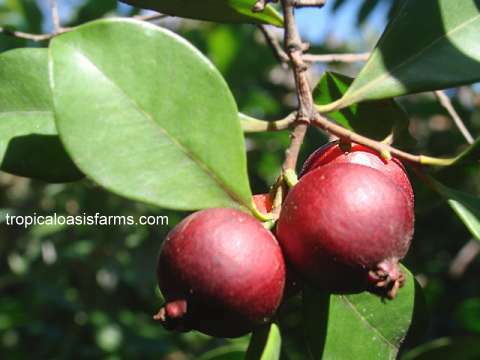 The strawberry guava is fairly drought tolerant although regular watering is important during fruit developement. It is a fairly slow-growing plant smooth glossy leaves. It is an attractive ornamental plant and is frequently used in hedges. The strawberry guava can also withstand about ten degrees below freezing with little effect. The South African yellow guava is a sub-tropical guava with yellow skin and aromatic yellow flesh. 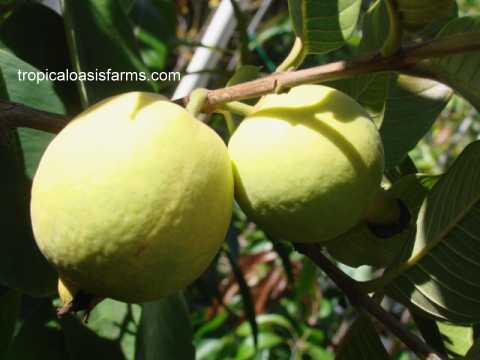 In California, the South African yellow guava is an evergreen shrub or small tree which grows to about 16 feet tall. Once established, the South African yellow guava is somewhat drought tolerant although regular watering is very important good fruit developement. The South African yellow guava can withstand temperatures of several degrees below freezing with little effect. The South African yellow guava fruit has a strong pleasant fruity guava flavor that is very delicious, and they generally are 2-3 inches in size. The fruits ripen in California September thru November. The South African yellow guava is a very popular guava variety for eating right off the tree and for making delicious fresh guava juice! Another very special guava variety we offer is the "Red Hawaian Tropical Guava". The Red Hawaian guava is a sub-tropical guava with yellow skin and aromatic red-pink flesh. 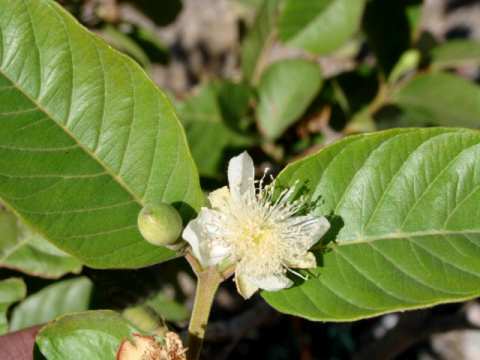 In California the Red Hawaian guava is an evergreen shrub or small tree which commonly grows there to about 15 feet tall. Once established, the Red Hawaian guava is somewhat drought tolerant although regular watering is important for good fruit developement. The Red Hawaian guava can withstand temperatures of several degrees below freezing with little effect. The Red Hawaian guava fruit generally are 2.5-3.5 inches in size. It has very strong guava flavor and is delicious for eating right off the tree, although it also is one of the most popular guava varieties for making fresh guava juice due to its intense guava flavor. The fruits are perishable and they can bruise easily after being picked. The fruits ripen in California September thru November. Guavas are easy to grow in Southern California, requiring very little maintenance for the growth of healthy, productive plants. Fruit size and quality depends mostly on adequate water supply at the time of fruit development. Guavas should be watered regularly, but especially during bloom and fruit development. Most guavas have fairly good drought tolerance. Guavas require very little pruning, just enough to keep an attractive shape. Many of the guava varieties make wonderful healthy juices that are high in vitamin C.
We offer guava plants for sale in a variety of sizes ranging from 3 to 15 years old in more than a dozen different varieties. 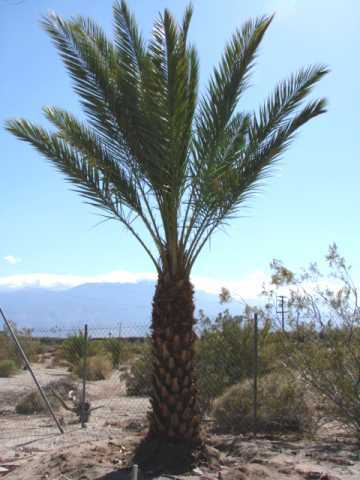 We have date palms available in all sizes, including male date palms for pollination and for landscaping, and female medjool date palm offshoots for date production. SHIPPING: For small to medium size trees, we recommend that customers personally pick up their own trees and take them home in their vehicle. Local delivery of your selections to your driveway can usually be arranged (only in Southern California, minimum purchase $150) with a delivery cost from $30 to $150 depending on the round-trip mileage (150 mile maximum round-trip travel distance). Transport for large trees/palms can also be arranged. We do not offer "mail order" shipping for plants & trees.